My dad was sent to Xichang, an outpost, to “reform” and “serve the people” when I was born. Dad saw me, his firstborn, for the first time when I was a seven-month-old. The Little Red Book in my hand served as the standard photo prop and rattle for a baby. I looked a little rattled—the photographer was shining too much light on me with a rice-bowl-sized Mao pin. I grew up in China, and might have had a rare case of dyslexia for my native Chinese language. Fortunately, I had a good memory and had done very well in Chinese schools: I often scored 100% or very close on exams in which memorization was essential, even though I didn’t quite understand what I was being taught, except for math and science, where I could apply numbers and logic. This was long before the advent of computer, internet and smartphones, and so my mother was always afraid that my memory would run out, that I wouldn’t have enough to power all the knowledge or wisdom one needs to acquire in a lifetime. She taught me to remember only my mistakes, so as to optimize my cognitive memory and so I would never repeat the same mistakes. She even tried hard to help me memorize all my mistakes and constantly refreshed my memory of them. In retrospect, one recurring “mistake” I made as a child was indulging in happy memories instead of strictly following my mother’s teaching. And my father was an obliging accomplice, as he deferred parental judgment. A delicious morsel of memory dates from the summer when I turned five, the first summer I remember spending time with my father. I can still taste the early picked apples filled to the brim on the army trucks: all green and small, only the ones with wormholes and scabs were sweet. My father had been working in Xichang (a town in a mountainous region that would become the home of China’s Satellite Launch Center) 270 miles away from our home in Chengdu (a city of 14 million people), where my parents still reside. Dad was a geologist who lived in a military camp of the People’s Liberation Army (PLA). He was a quiet man, but I could ask him anything to my heart’s content. That glorious summer day, my mom, my eight-month-old baby brother, whom my dad had not yet met, and I finally arrived after twelve hours on a sardine-packed slow train. 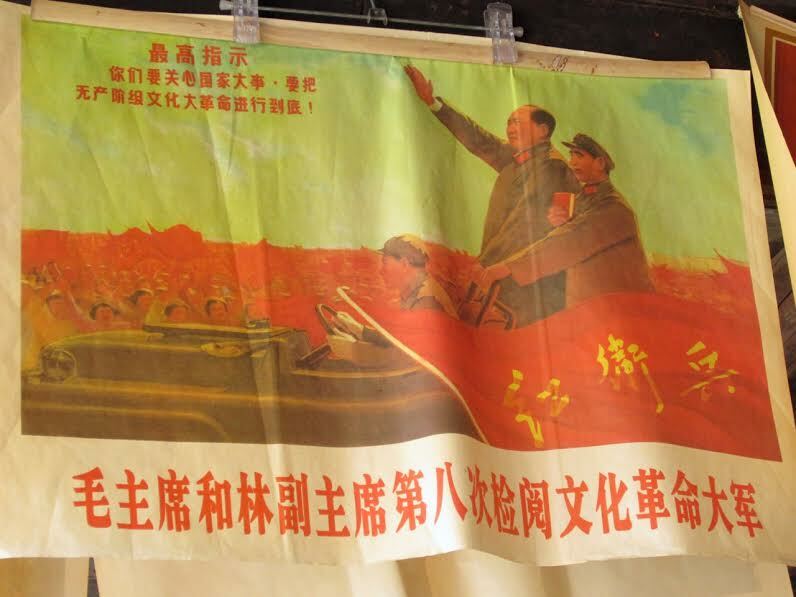 Mao’s revolutionary Red Guards with red armbands hung on the doors and windows of the moving train for a free ride. Xichang was hustling and bustling with PLA soldiers in green uniforms and red stars, carrying real guns. The army farm had harvested the green apples before they were ripe and the soldiers were handing out the apples from loaded army trucks. Dad said the apple trees would be chopped down to clear the way for an army project. I saw real helicopters and tanks for the first time in my life—the army was performing war games on the base. Dad got me a fresh collection of shells, so fresh out of the barrels that I could smell the gunpowder that left black circles on my hands. The shells were the coolest present a kid at that time would ever dream of, a collection that would make me the envy of any playground. I begged Dad to take me to the shooting range to collect more shells, when the soldiers were studying Mao’s Little Red Book, and Mom was nursing baby inside our temporary dorm. It was a beautiful night: the full moon lit up the sky and the ground, and I had my dad’s attention all to myself for the longest time. Dad and I sat on a rock on the edge of the shooting range, and I was full of questions. “Is there a God, and Goddess?” I had heard about gods and goddesses from folklore and fairy tales, the very ones Mao’s Red Guards had been campaigning to eradicate, but I secretly wished for an all-knowing deity who would help me out when I got into trouble. “Can Americans make eternal medicine?” I liked the way the word “America” looked and sounded in Chinese: 美国a beautiful country, but the war sounded like a spoiler. “Do they have a nicer God, or maybe they have a genie?” All Chinese gods in fairytales and folklores I had heard of were tyrannical and fearsome, and goddesses moody and fragile. I hoped the Americans had a better deal. It was a lot of information, but I took it all in. “But Chairman Mao hasn’t said anything about a genie. Does a genie make my wishes come true?” I was closing in on my quest. Dad turned to look behind us, as if he was trying to spot an eavesdropper. I could only spot the army camp trailers in the distance, their lights flickering in the steamy summer air. The shooting range guardhouse was now dark—not a single living soul around, just the two of us. “Are you and mom too poor to buy candy?” I had had a dozen hard candies and one toy at that point in my entire life. “—but you promised to tell a genie story…” I knew that life would be hell if we were deemed a “Class Enemy.” I grasped the bullet casings and willed myself not to interrupt the story. Dad looked hesitant, but he did not renege—he was a man of few promises and, as far as I knew, he had never broken any of them. “All right, we’ll save our own stories for another day. So the little girl wanted to be wealthy with unlimited gold. She asked the genie to turn everything into gold so that she could buy anything she ever wanted—candy, toys, even castles, carriages, and beautiful clothes. She got her first wish granted. “Everything—food, water, books, clothes, candy and toys—turned to shimmering gold. But she quickly realized that she couldn’t eat, drink, read, play or live in gold. So she used another wish to ask the genie to turn everything back to its original state until she could decide what she truly wanted. She came up with a long list of wants, but she still wasn’t sure which one was the most important, because she had only one precious wish left, as the genie reminded her. “So what does she want exactly?” I was eager to hear the secret, as Dad fixed his eyes on the moon and seemed to be lost in his thoughts. I had wanted to ask more about the unknown, and trial and error, but an incredibly loud bell rang, disrupting the tranquil night—a warning that the lights would soon be off and curfew would start in the camp. We ran and I asked Dad to carry me, as my legs began to hurt. I soon came down with the acute symptoms of infantile paralysis, according to the self-taught army nurse, who had studied Mao’s Barefoot Doctors Manual. Polio had not been eradicated at the time and some children had not been vaccinated. To save my life and legs, my parents pleaded to see a doctor in the nearby reformation labor camp, which was ringed with barbed wire. They didn’t care if the doctor was as guilty as the Red Guards claimed (the labor camp was for Rightists, Capitalists and people with bad thoughts and bad character). The long ride on the unsanitary train was ruled out as the culprit since my baby brother was fine. It turned out to be the apples, or at least that’s what they speculated: I had eaten bad apples and they suspected I might have ingested a bug when I wolfed down the sweet ones. Since the apples were from the army farm and I might be infected with poliovirus or even unknown strain of virus, Dad leveraged that theory to get me admitted to the army hospital, which was off-limits to average civilians. Dad prayed to those unknown gods, the ones he wasn’t sure even existed. My legs were saved. I turn out to be a runner for life. Mao Tse-Tung would die two years later and take his dying thoughts—Maoism—with his eternal body to a crystal coffin on one side of the Tiananmen Square. The Cultural Revolution would end. I would only remember my dad’s fairy tale and forget most of Mao’s teachings. I haven’t yet found the right bottle or seen a genie, but the fairy tale of the three wishes did come true. And this is the true story of how it did. 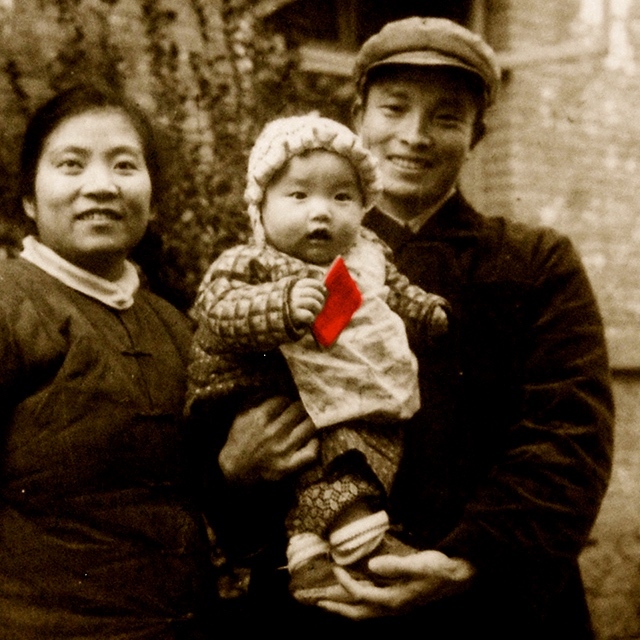 The tall man is Mao Tse-Tung receiving Red Guards, the short man holding the Little Red Book is Lin Biao, who wrote the script on my baby photo and later attempted to assassin Mao. Rebecca Li-Huang was born in China to a Tiger Mother and a permissive father, and came to the US by herself with $250 for graduate school in 1990. She has worked and lived in the Midwest, Northern California and the UK. She lives near Philadelphia with her husband and two children. Rebecca holds a Master of Science from Purdue University and an MBA from the University of Chicago. This is an excerpt from her book: Green Apple Red Book: A Trial and Errors, A Memoir of a Chinese-American.